Looking for an early Spring getaway? Not sure what to do for Valentine’s and no time to plan? We’ve got you covered. Plan a Greenville, South Carolina getaway to the Swamp Rabbit Inn and experience a Foothill Foodie Tour. If you believe the groundhog or if you don’t, one thing’s for sure, Spring is definitely on its way to Greenville. Our fabled weather friend the Groundhog predicted we’ll have an early Spring and it seems the stars are already aligning. Take a stroll around downtown Greenville, South Carolina, and you’ll see the leaves and buds of daffodils starting to burst forth. It’s the perfect time to visit and learn more about this little Southern city everyone is so smitten with. No sure what to do when you arrive and need the perfect Valentine’s idea? Rest easy, literally. We’ve got you covered. Book your Swamp Rabbit Inn stay and book a Foothill Foodie Tour. What is a Foothill Foodie Tour? Well, we think it might be the best way for tourists and locals alike to experience the people and food and drink creations that make Greenville, South Carolina so special. We started our Friday evening in downtown Greenville with the Vine, Stein and Shine Tour. We met our Tour Guide, Rose, the owner of Foothill Foodie Tours, on the steps of Trappe Door at 4pm. Even on a typical January afternoon, it was pleasant enough to stand on the steps and chat outside while we waited for our group. Once inside Trappe Door, it was time for our tour to begin. Trappe Door is literally an underground bar, and you’ll feel you’ve been transported to another time and place. The Belgian style pub is well-known for its happy hour, delicious food, unique beer selection, and it’s one of our favorite spots for Sunday Funday. We sampled four of Trappe Door’s current beer offerings, fresh on the heels of their sold out Biggest Little Beer Fest. We learned about the source of the brews, the recipe for perfecting them, and made sure we were well prepared for our entire tour by snacking on fresh made Belgian fries with Trappe Door’s signature dips. If the start of our Foothill Foodie Tour was any indication, this was going to be the best Friday yet. Jerky and Vine of course has beef jerky (they make their own! ), but most Greenville residents and visitors alike miss the gem of this location in the wine selection. If you’re a wine lover or just want to talk shop with a guy who knows his stuff, you’ve got to visit Jerky & Vine. We were absolutely astounded at the wine and chocolate pairings and our local hosts knowledge of the varietals, their regions, and the winemakers. Wines were paired with local chocolates from Cocobon in Anderson, South Carolina. We tasted red and white varietals and may have been most surprised by the delicacy of the bacon infused chocolate paired with a rich red wine. Inside Jerky & Vine you’ll find McBee V’s Public House, with happy hour special, beer and wine by the glass, and the perfect selection to take back to the Swamp Rabbit Inn for your nightcap. Who knew learning about wine making could be so interesting, and so accessible in downtown Greenville, South Carolina? Our next stop was Dark Corner Distillery, also located on Main Street in Greenville. Dark Corner Distillery, named after the region’s nickname for over 175 years, is a craft micro-distillery producing small batches of Moonshine, aged whiskey, gin, absinthe, and other spirits in Greenville. 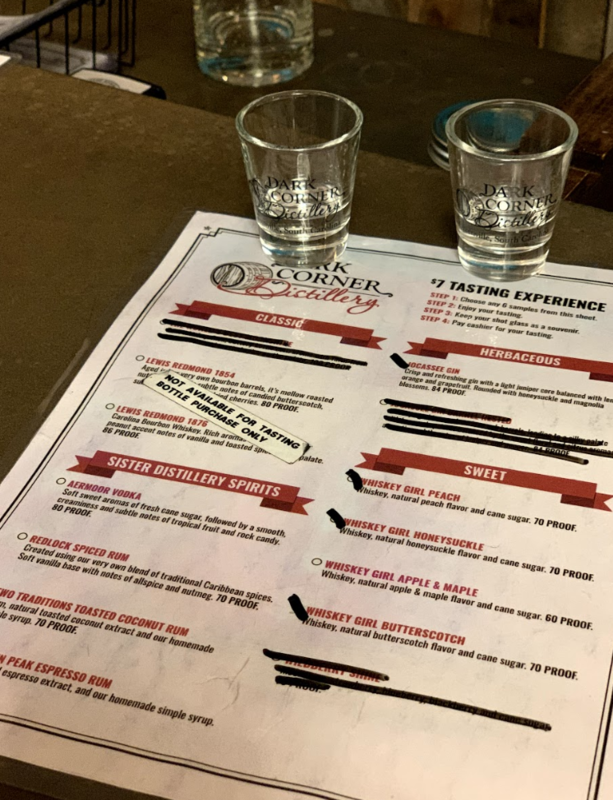 Our experience at Dark Corner was educational and delicious, as we learned the process behind making each of our selections, plus recipes and serving ideas. We aren’t going to lie, you won’t leave Dark Corner without taking a few bottles home with you. 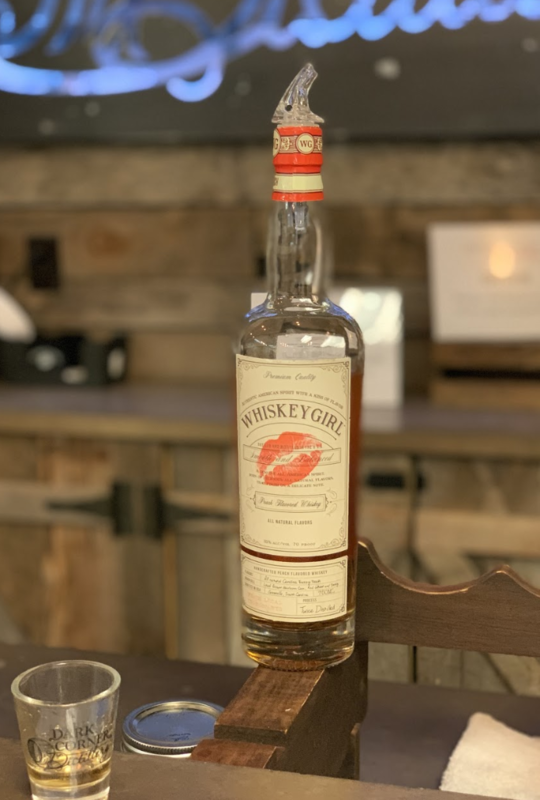 Even if you think whiskey and Moonshine aren’t your thing, you might find a new favorite during the Dark Corner Distillery stop. Our final stop was the perfect end to the happiest hours we’ve had in downtown Greenville in quite some time. We stepped just next door to Crepe du Jour to experience the offerings of this creperie and bar with authentic European style. We ended our tour with sweet crepes stuffed with strawberries and almond cream and a champagne cocktail. However, we discovered the menu at Crepe du Jour features savory crepes perfect for any time of day, and the bar is a bright cozy spot for grabbing a drink on a night out. The energetic and bright interior of Crepe du Jour. Our Vine, Stein and Shine tour of downtown Greenville, South Carolina with Foothill Foodie Tours was unique and educational. We learned things about the people and places in Greenville we never would have discovered on our own. Foothill Foodie Tours makes it easy to turn your Swamp Rabbit Inn stay into an experience, and leaves you hungry (and thirsty) for more of Greenville and its welcoming people. Enter our contest to win a free one night stay at the Inn, plus a bike rental and a Foothill Foodie Tour. You’ll find the contest post on our Instagram and Facebook pages, but you only have until Monday, February 4 to enter. Ready to book your own February getaway? Take advantage of low Winter rates at our downtown Greenville Inn, and then reserve your Foothill Foodie Tour.